Vue.ai's trend analytics delivers trends and themes which can help design your marketing and promotional campaigns. Using insights on trends and styles helps you promote relevant products for your shoppers through curated collections on home page, emails and more. Home Page: Curate relevant trends and styles on the home page to impact your shoppers' journey right from the start. Social Channels: Curate collections for social media campaigns based on style and product spikes across popular social media influencer sites. Targeted Emails: Use the personalized insights on trends to develop theme specific campaigns for your shoppers. Ad campaigns: Make your marketing campaigns relevant and up-to-date on trends for better impact and engagement. Improve Brand Stickiness & Relevance: Ensure your home page has the current trends and themes to increase the stickiness of shoppers on your site. 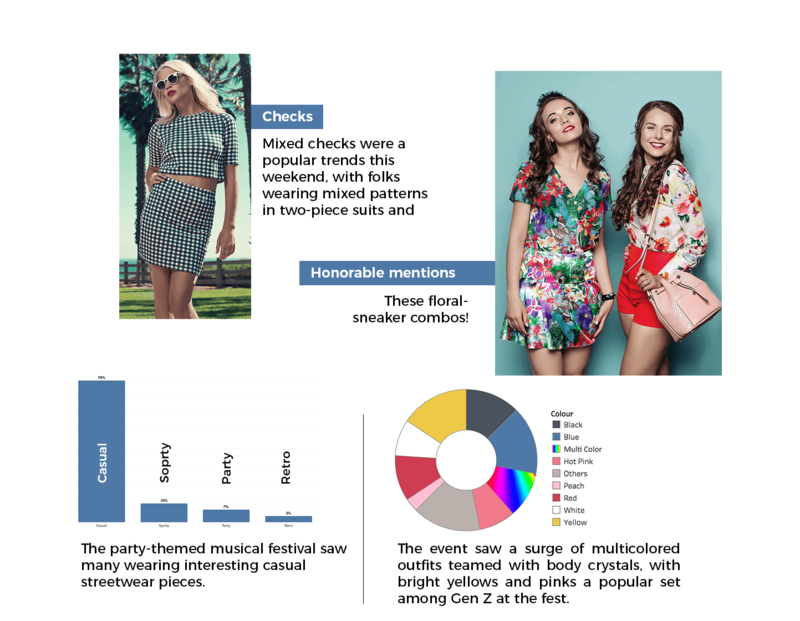 Marketing: Use insights to identify user generated content from social media imagery that can be made shoppable with VueStudio’s Shop the Look feature. Planning & Inventory: Automate forecasting and inventory management processes with algorithms that forecasts what needs to be in stock, according to the latest trend. Merchandising: Enable merchandisers, with relevant data on what is trending, to make effective & efficient product decisions. Relevant Trends: Provide a go-to destination for shoppers to know which styles are trending and are relevant to them. Shopper Experience: Provide a seamless experience for the shopper across their social media and their shopping site, being able to shop for trending looks and themes. Shopper Journey: Make the shopper journey engaging and enjoyable with the right kind of products highlighted and marketed.